Pure traditional country whose roots lie in traditional country music but have a little blues thrown in. Influences are Jean Shepard, Loretta Lynn, Anita Carter, Tammy Wynette. "Real country" with LOTS of fiddle and steel guitar. Just by looking at her you'd never guess that Tracey K. was also a truck driver. This little lady can handle a rig like she can a country song. She's about as country and down-to-earth as you can get. A few years ago she got off the road as an OTR driver, and is concentrating more heavily on her music once again. Born and raised in Western Canada, surrounded by "country music and mountains", she comes by her musical ability naturally.... it runs in the family. All her relatives played and sang and she remembers many a jam session the family would have singing and playing country music from the 40s through 70s. While growing up in Quesnel, B.C. she "discovered" her mother's record collection of country and rock 'n' roll from the 50s and 60s, and was in "heaven"! Her major musical influence is Loretta Lynn, but other favourites include Jean Shepard, Tammy Wynette, Marty Robbins, Faron Young, Hank Williams, Lefty Frizzell and Merle Haggard to mention just a few. But it was in Drayton Valley, Alberta where she was exposed to even more country music and where she first met Canadian singer/songwriter Ray Griff, who had a major impact on her life. There's no doubt that Tracey K. has roots firmly planted in country music, which you can't miss when you hear her sing traditional country music. At age 9, in Quesnel, BC, Tracey K. made her first public appearance playing piano. In '87 she made her stage debut at the Royal Canadian Legion at a Gary Buck show during a Stampede performance in Calgary, Alberta. Afterwards she performed with many bands in the Calgary area, as well as British Columbia and Nashville. In 1991 she recorded a self-titled mini-album; in 1993 her first single "He's Not For Real" peaked at #12 in Europe; in 1997 her second album "Falling For You" (on Rosebud Records) scored a #1 single of the title track on the National Independent Charts in the U.S. in December '97, remaining in the Top 20 for 8 weeks. Her latest album on Songbird Productions (out of Calgary) is entitled "I'm Not the Same Girl" and received plenty of chart action overseas, having received an Award for substantial airplay for the single "Count Me Out". Her single "The Girl In Oklahoma" was a hit on the European charts for FIVE months! It also received significant airplay in the USA. Other singles from the CD include: "Count Me Out", "Deja Blue", "The Middle of the Bed", "I'm Not The Same Girl", "Lonesome", "You're Walkin' & Talkin' In My Sleep Again" and "Hot Steamy Night In Dixie". All of them did really well in Europe and overseas. Tracey K has plans to go into the studio again soon. Most every year she appears at Fan Fair (now known as CMA Music Festival) in Nashville to meet and chat with old and new fans alike. In 1998 the New York State Country Music Association nominated her as Female Vocalist of the Year. She recently received 3 awards in 2000: An Airplay International "King Eagle Award" ("Artistic Career Achievement"); the Lonestar State Country Music Association's Best of Texas 2000 Awards ("American Horizon Award" and "Canadian Recording Artist"). In 2001 she was awarded "Album of the Year" from the Lonestar State Country Music Association's Best of Texas 2001 Awards for her CD album "I'm Not The Same Girl." 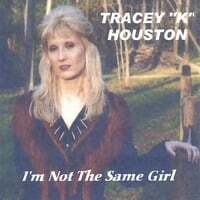 ...This is one that all should listen to..the music is great the voice is untouchable...and this album will put you into a toe-tappin spirit...Good Job Tracey K.
this is country music at its best. an excellent set of country songs from an artist who deserves every success. Another great collection of classic country by a great artist. Highy recommended if you like true classic old country! !